A plywood core makes this cafeteria table significantly stronger than the standard options. 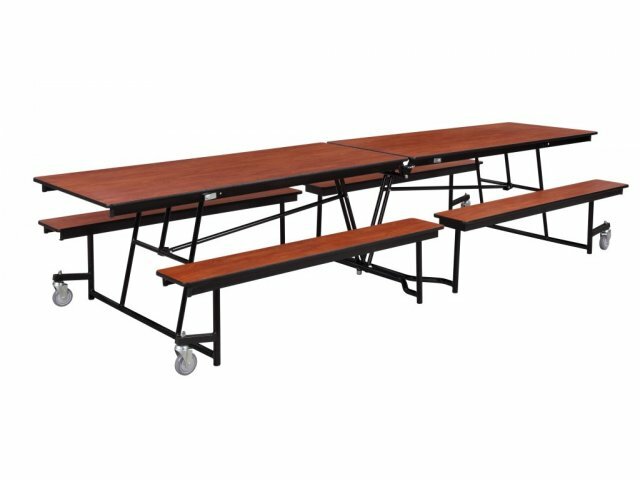 National Public Seating Cafeteria Tables feature an ideal design for both students and school employees. 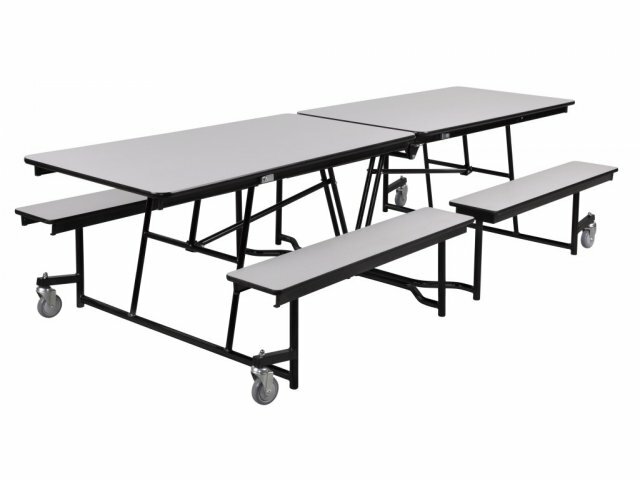 These portable lunchroom tables are durably constructed for maximum convenience. Six walk–in entry points and a curved frame design make it easy for students to slide into seats without tripping over benches and metal bars. When it’s time for cleaning, tables lift easily off the ground, locking in the midway position, so the floor can be swept easily. 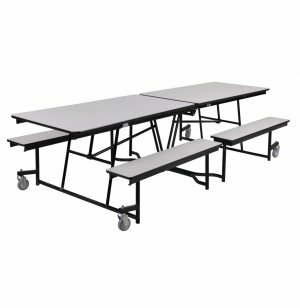 Need to move tables to a new location or clear space in your lunchroom? 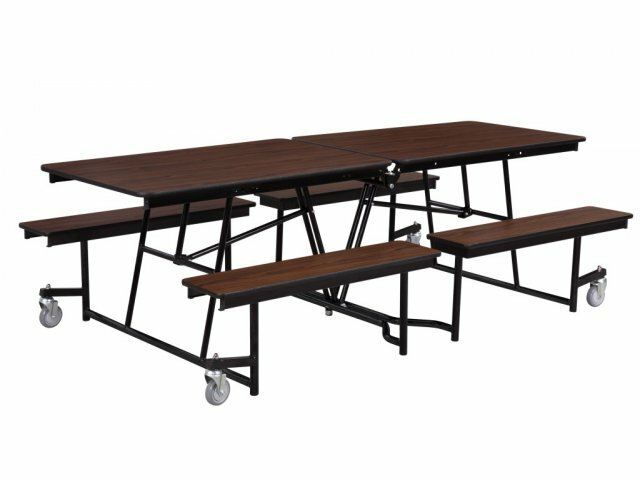 These cafeteria tables easily fold up for transport, rolling into storage on four heavy–duty, double ball–bearing casters. When tables are ready to come out again, the storage latch is easily released using levers on either side of the lunchroom table. Tough Core: Strong, sturdy plywood core makes your table extra durable. Sleek Frame: Attractive chrome frame is easy to maintain and offers excellent durability. Convenient: Six walk–in entry points enable students to sit down without having to climb over benches. Simple Setup: Storage latch includes release levers on either side to enable easy release. Foldable: Torsion–bar system makes tables easy to lift and fold. Secure: Table locks in open position. Easy Cleaning: Midway–position lock secures table in partially folded position for cleaning. Strong: Tabletops are supported by 14–gauge steel frames and aprons. Benches are reinforced with 16–gauge aprons. 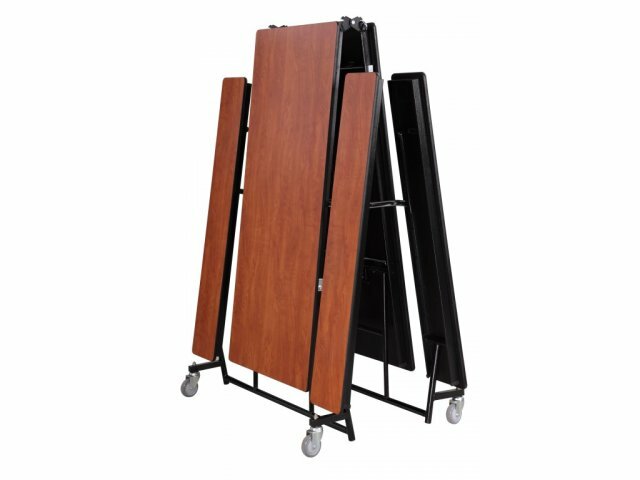 Mobile: These tables are easily rolled into position on heavy–duty, double ball–bearing casters. Protects Floors: Hard–rubber wheels won’t leave scuff marks or scratches on your floors. Stable: Casters lift off of the ground when table is in open position. Safety First: Curved frame design prevents tripping during entry. One–inch gap between tabletop pieces prevents pinched fingers.